“Joan” is a 2′ 6″ gauge 0-6-2T built by Kerr Stuart in 1927 for use on a sugar plantation in Antigua. Following a long career there she was rescued and shipped back to the U.K. and now resides on the Welshpool & Llanfair Railway. The model has been updated and re-introduced to the Accucraft range. 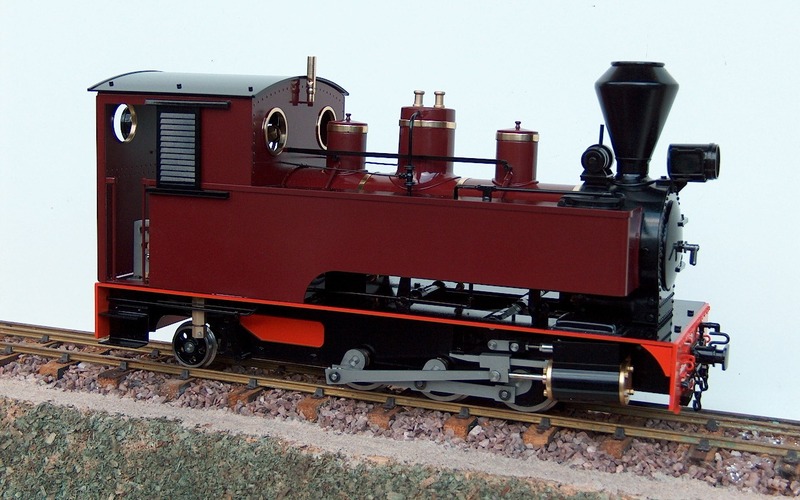 This model has internal gas firing with a stainless steel superheater, and the smokebox door opens to aid lighting. The boiler has a water level check valve with the overflow piped away below the frames and the lubricator is fitted with an underfloor drain tap, both of which help to keep the cab free from excess oil and water. The revised model is fitted with our standard chopper couplings (not as illustrated). 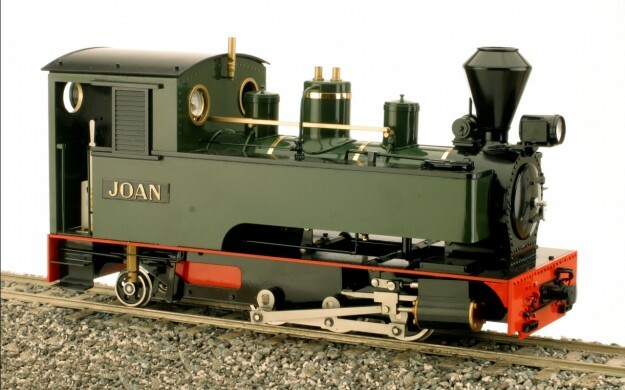 The model is gauge adjustable from 32mm (‘O’ gauge) to 45mm (‘1′ gauge), has insulated wheels as standard and is supplied with alternative pony trucks for 32mm and 45mm gauges. The axles run in bronze bearings and all the rods and valve gear are manufactured from stainless steel. The engine is available either in manual or radio control versions. The cab roof flips up and over sideways to give access to the gas, water and lubricator fillers. The boiler is fitted with a water level check valve and the displacement lubricator has an under floor drain valve. The model is built from stainless steel and brass, and with the correct maintenance, will give a lifetime of pleasure. Gauge: 32mm (O Gauge) or 45 mm (Gauge 1). Controls fitted as standard: steam regulator/reverser, safety valve (set to 60psi), pressure gauge, displacement lubricator, water level check valve and gas regulator. Cylinders: bore 1/2″ (12.7mm), piston stroke 3/4″ (19mm). Valve gear: Simulated Stephenson link, piston reverse valve controlled by lever in cab. All rods and valve gear are manufactured from stainless steel. Boiler: internally gas fired, stainless steel superheater, opening smokebox door. Lubrication: Displacement type, fitted with underfloor drain. Filler cap with ‘T’ bar for easy removal. Wheels: insulated as standard with axles running in bronze bearings.